Alec Baldwin is considering running for President of the United States. 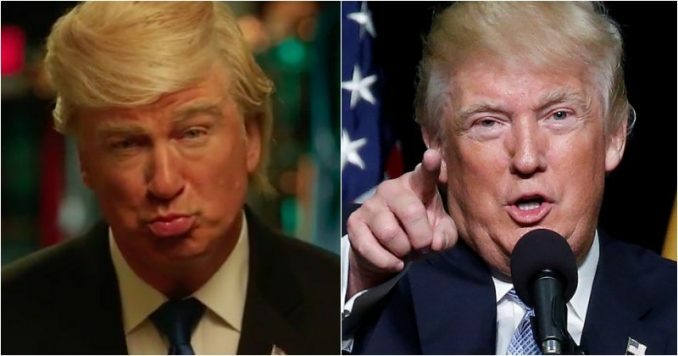 That’s right, the far-left actor who plays President Donald Trump on Saturday Night Live thinks he could do the job in real life. The 61-year-old Trump-hater sent out feelers this morning telling the world he wouldn’t ask for any money, and he assured his supporters that beating the president would be “so easy.” But that’s not all. Baldwin immediately got destroyed. You’ll love this. Baldwin is one the generals in the Hollywood crowd’s army of Trump-haters. He’s distinguished himself as one of the biggest sufferers of Trump Derangement Syndrome, making wild accusations which have no basis in fact. Proving he has lost his mind, Baldwin actually is toying with running for president. And it’s really ironic how the rabid leftist sees punishment and sins. For the 61-year-old, aborting babies after birth is fine. After Alec signed Alyssa Milano’s ridiculous petition to punish the state of Georgia for signing the “born-alive” bill, which protects babies born alive after a botched abortion, brother Stephen Baldwin spoke out. Well, Alec asked should he run, and Americans answered. “Is this the same Alec Baldwin who when auditioning for his own Talk Show, had NO CALLERS call after begging for callers to call in? He then walked out while on the air because of lack of callers. Yea…….Good luck with winning a presidential election. Hee Hee,” tweeted Kurt Templeton. Is this the same Alec Baldwin who when auditioning for his own Talk Show, had NO CALLERS call after begging for callers to call in? He then walked out while on the air because of lack of callers. Yea…….Good luck with winning a presidential election. Hee Hee. “Yeah, it’s just all that stuff about actually running a country that comes after the election that can make or break you. Look at what happened with [Obama]. He did it twice. Identity politics gave him the office. And we nearly lost our republic,” tweeted Newt Ware. Yeah, it’s just all that stuff about actually running a country that comes after the election that can make or break you. Look at what happened with Soetero. He did it twice. Identity politics gave him the office. And we nearly lost our republic. Others reminded the 61-year-old that he has anger management issues with parking spaces, so how could he run the White House? Baldwin was arrested after accosting a man over a parking space, another infamous viral moment. Yet, the SNL star is such an egomaniac he is really considering the possibility he could run and winning would be “so easy.” Well, it wasn’t even close. Americans weighed in and laughed at the actor’s hubris. He may badly play the president on TV, but that doesn’t qualify him to do it in real life. Once again, the world is laughing at, not with, Alec Baldwin.